Actress Shay Mitchell ate lunch in the bathroom in school to avoid bullies. The Pretty Little Liars star's Filipina and Scottish roots made her a victim of bullying when she was growing up in the predominantly-white Vancouver, Canada. Her mother, who is Pinay, was sometimes mistaken as her nanny. Shay explains she found it easier to eat alone and not confront the bullies. "Instead of going to the cafeteria, I'd say, 'Why deal with this?' and I'd eat in a bathroom stall," she tells Self magazine. But she can't imagine what life is like for tormented teenagers today, adding, "At least when I left school for the day, it stopped. It doesn't now. You have your phone on you, and the bullying continues. I can't imagine having all these inescapable outlets when I was that age." Despite her struggles in school, the 29-year-old always knew she was destined to be famous and acted accordingly while working as a waitress at a high-end bar in Toronto, Canada. "I would walk around as though I were in a movie," she says. "I was already a successful actress in my mind." She also relied on her dream board to keep her moving forward. "It was a corkboard in my kitchen, with pictures of the Hollywood sign and Gossip Girl because I wanted to be on a show like that," she continues. "I really believe in the power of visualizing—having faith—and then working your a** off." Shay plays lesbian Emily Fields on Pretty Little Liars, and now the show is coming to an end on its seventh season next year. 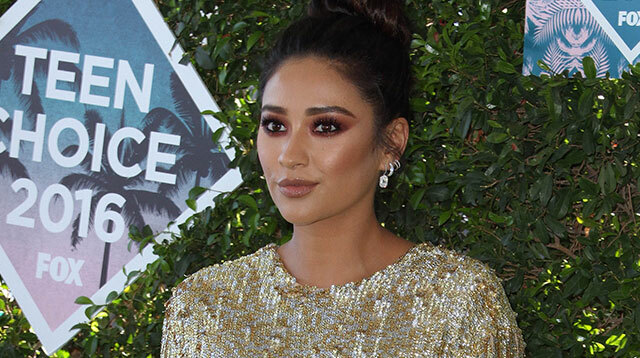 Shay is grateful she got the chance to play the role because of the character's sexuality. "I got to be the vehicle for a conversation about sexuality," she adds. "A lot of the feedback was, 'Thank you for playing this character'." After the show ends, Shay is looking to expand her horizons. "You don't have to stay in a box," she adds. "Just because you started off in one industry doesn't mean you can't jump into another one. I wouldn't say that acting is a stepping-stone, per se. But it's another step in the direction of where I want to go." "The message I'm trying to put out there is that you can do whatever you want to do, and if I'm going to say that, I need to do it myself," she continues. "If I want to become a singer and drop a single next month, I'm going to do that."